Following the surprise identification of King Richard III in a car-park in Leicester last year, fresh impetus was given to try and fill in more of the blanks of Britain’s long line of monarchs. There are a few to choose from, King Harold who was famously killed in the Battle of Hastings in 1066 is one big name though that particular task is made difficult by the fact that no-one is entirely sure where he was buried. However, one king that could possibly be identified with a great deal of investigation and a bit of luck is Alfred The Great. With famous monarchs such as Victoria, Elizabeth, Henry VIII taking much of the history head-lines, its often easy to forget that there have been monarchs ever since the Romans both withdrew and finally expelled between 383-410AD. That gives us over 1,600 years of almost uninterrupted rule and in all that time, only one monarch was ever given the epithet of The Great and King Alfred. So why was he so great? Well without him, their might never have been an England in the first place. Ever since Roman times, England in particular was being settled by peoples from northern Germany, the low-countries and Scandinavia. The Germanic tribes were more or less peaceful whilst the Vikings and later Danes were often warlike and initiated violent raids and invasions. It is into this period with half the country under occupation and with a vague sense of common solidarity if not really nationalism that Alfred was born into the royal family of Wessex. He was schooled in Rome and on his return assisted his three elder brothers who each ruled for only a short number of years. In 865AD the Danes landed a massive force in East Anglia with the aim of toppling the Anglo-Saxon kingdoms and seizing control of the entire country which even then was rich in natural resources and wool. 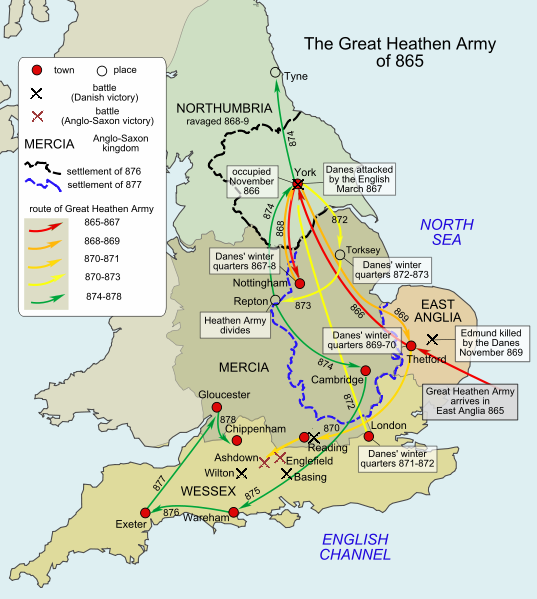 The Great Heathen Army initially made peace with the East Anglian rulers in exchange for horses which allowed them to move north and conquer the Kingdom of Northumbria and its capital of York leaving a puppet ruler King Ecgbert in charge. Alfred accompanied his brother King Æthelred to Nottingham but the Danes refused to leave the castle and soon were granted the city by its ruler, the king or Mercia, in the hope they would leave the rest of his kingdom alone. Soon though the Danes left and conquered East Anglia under the splendidly named Ivan The Boneless and a number of battles followed between them and Æthelred and Alfred with victories and defeats on both sides before Æthered died on 23rd April 1871. The new King Alfred was in a perilous state, his army was weak and the rest of England was in Danish hands. Soon despite occasional victories by his smaller forces, Alfred was surrounded with the Danes now even occupying the SW of England. At times, especially in the beginning, Alfred was no doubt very much under the pressure of the Danes leaving him with no choice but to make peace at any costs. However Alfred was very clever at arranging cease-fires and at negotiations and he managed to buy himself time to re-group and strengthen so that when he was next attacked he won a stunning victory. He again made peace but ensued that the Danish King was baptised. Time after time Alfred fought and negotiated, often leading his army with astonishing personal bravery. At times he used outright bribery to free some of his lands, paying the Danish lords a fortune to get them to leave certain key towns. On one occasion he dressed up as a minstrel to infiltrate and spy on a Danish camp. Alfred also fought the Danes at sea and made the very first steps in creating a national navy that would one day become the Royal Navy as well as a coherent military strategy to defend against the untrustworthy and often aggressive Danes. King Alfred also improved and standardised law, basing it more fully on Christianity. It was the beginning of Common Law and is the basis of laws in all English speaking nations and some others too. He created a better taxation system and reached out to rulers as far away as Rome, Jerusalem and Baghdad. Closer to home elements from Wales, Scotland and Ireland too began to ally themselves to him to various degrees in a much more peaceful manner than the wars which the later Norman Kings had in mind. He may have created a nation but Alfred was useless in the kitchen. One thing Alfred wasn’t very good at is cooking. One day, he and his men were ambushed in Wiltshire. Desperately looking for food they were found my the wife of a lowly pig-herder who cooked for him and some men. Later she made some cakes and left Alfred in charge so they didn’t burn in the fire. Famously he somehow let the cakes burn and when the wife returned she furiously told him off! The Danish invasions had ruined countless monasteries, places of learning and manuscripts and these were all things that Alfred worked hard to restore. He thought that only with education could the country improve and defend itself. In fact Alfred was a scholar himself and somehow found time to translate numerous religious and legal documents. Located on Southwark Bridge in London. Alfreds capital was in Winchester and there are several monuments still to him there but in 886 he managed to occupy London and make it functional again. This achievement along with his political cleverness and extended family meant for the first time, even though he never proclaimed it himself, Alfred began to be the first King of all England. 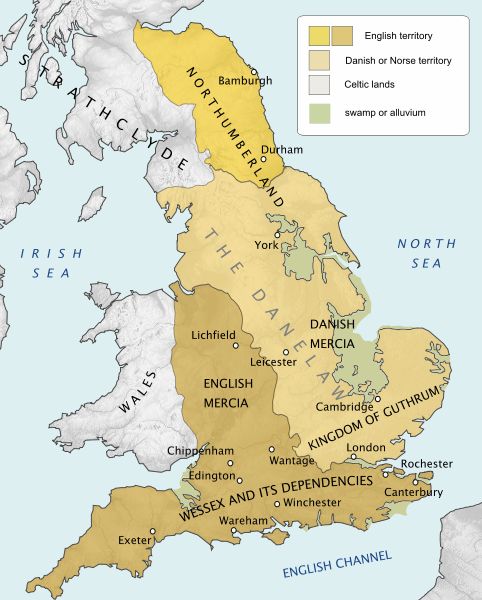 Alfreds allies in Mercia managed to make inroads into Danish territory and by 910 East Anglia and Mercia were back in “English” hands. Alfred was clever enough to allow Danish lords to keep many of their lands if they switched allegiance. Danish rule ended in the country in 954 when Eric Bloodaxe was thrown out of Northumbria although the Danes continued to raid and sometimes rule parts of the country until and after 1066. Alfred The Great was an all round great ruler and just what was needed at the time. Unlike the later Normans, Alfred tried to use English rather than Latin so that his people could more easily be involved with the Church and he is seen as a very pious ruler who is seen as a Saint in some areas. A Byzantine (Greek) of Saint King Alfred The Great. 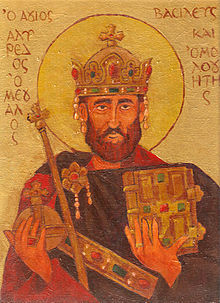 Having suffered from a Crohns like condition his whole life, he died on 26th October 899. He was buried in Winchester but his bones were moved two or three times which no doubt left us in the situation of not knowing where Alfred is at all. When his resting place was built over by a new prison in the 18th century, all the bodies were reburied in an undocumented way. In the late 1990’s excavations were carried out and a number of bones were recovered including one in particular from the High Altar area of the old minster where Alfred was last known to rest. The bone was identified as being Male and its age matched that of Alfred or his until now also missing son. With the identification of King Richard last year, scientists put more effort into identifying the bone and are confident they can extract DNA from it. However, they need a match to match the DNA with and the bones of his sister buried in Germany have deteriorated so that scientists can’t extract DNA. A move is now being made to track down descendants of King Alfred. 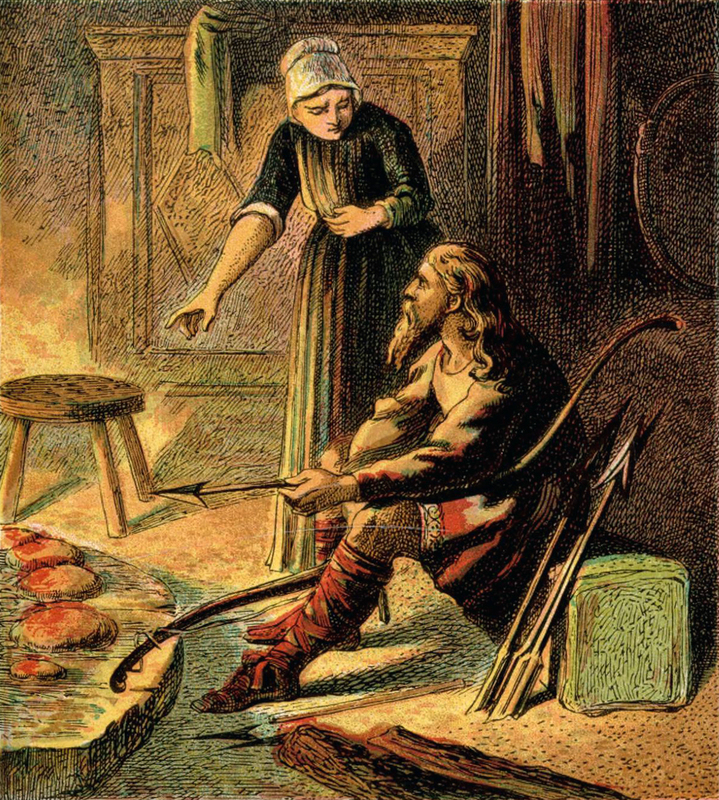 This technique with King Richard was successful but of course Alfred lived much much further back in history, However, many people who have tracked down their family tree claim King Alfred as his ancestor. It’s not as unlikely as it seems as I too have now got my family tree researched back to the 7th century with family members including Danish, Scottish and English kings and queens of the period and also poor old King Harold of 1066 fame. Perhaps one day when I can be bothered I will reclaim my throne and kingdom but I suspect I’d have to share it with a few dozen others!! 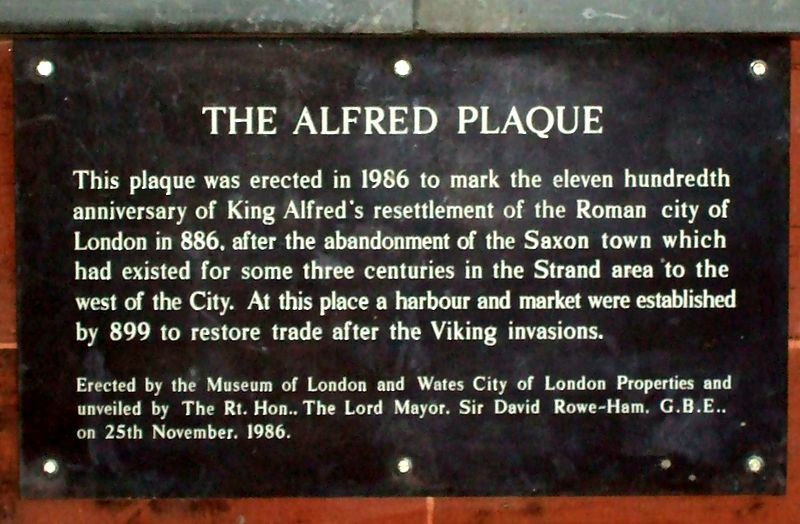 Alfred The Great was the first in a line of Anglo-Saxon Kings who ruled over a unified country until Edgar the Ætheling the final Anglo-Saxon King surrendered to William the Conqueror at Berkhamsted in December 1066. Surely with all these volunteers, it is only a matter of time before the bone is matched with a descendant and verified so that the man who united England and made his country free can be recognised as the great man he was, King Alfred The Great. 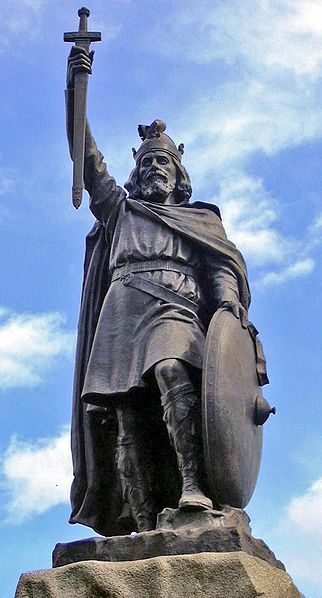 Statue of King Alfred The Great at his capital in Winchester. This entry was posted in history and tagged Alfred The Great, Anglo-Saxon, Culture, Danelaw, family tree, history, Life, London, News, northumbria, Winchester. Bookmark the permalink. 16 Responses to Have they found the missing bones of King Alfred The Great? Wow! I just read about this discovery this morning, but the article was not clear on exactly who King Alfred was. Thank you for such an informative (and fast) history. By chance I read a small report a day earlier so I wrote up my article and just by chance the rest of the media caught on with it too. I guess it can be hard to explain about someone who lived so long ago but often the reports seem to treat viewers as stupid. Sometimes it is necessary to go a little in depth to make things make sense. Thanks for commenting! Awesome post. I love your maps. Thanks Cindy. Those maps are good aren’t they. I am amazed how much land they have reclaimed from swamps in the last 1200 years. Great post – informative and fun to read. Thank you! Thanks! I’m glad you enjoyed it ! I did! Well done again! “Æthered died on 23rd April 1871” Very long-lived! But I enjoyed the read. Oh dear, did he live an extra 1000 years? I will have to go back and do some revisionist history and correct that. I’m glad that you liked the post though. Thank you for sharing. As always a great and fun post. Also like that I found a fellow chrons sufferer in King Alfred. Fascinating post. I just watched a programme with Neil Oliver presenting. Apparently William the conqueror is to blame for moving the bones of Alfred, then later, Henry VIII moved them again. No respect for history, those two. Yes I watched that programme too. There was a history programme on two days earlier I think all about Alfred The Great as well with the historian Michael Wood I believe. It is typical that two of the Kings that destroyed so much of the country would have no respect for King Alfred. I have read that, ironically, Henry VIII was beloved by the public as they all hated Henry VII. How history changes public opinion, eh? I also believe it was Henry VII who killed the princes in the tower, its surely more logical than Richard III doing it.